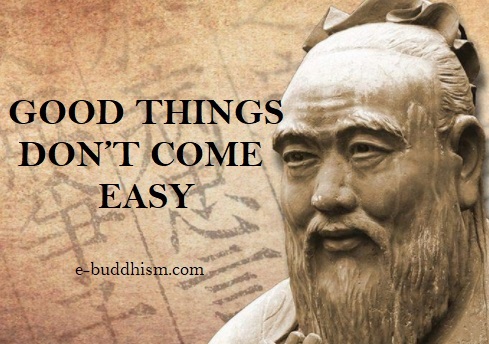 It’s been a long time since Confucius walked the Earth, but he is still considered to be one of the most important and influential people that have made a difference in the lives of humanity. His philosophies have significantly impacted people from all around the world, and they are still just as relevant in the year 2017 as they were when he died in 479 BC. Everyone has heard of ‘The Golden Rule’: “Do not do to others what you do not want to be done to yourself”but here are some more pearls of wisdom that will help us lead a happy and fulfilling life. Negative emotions tend to come much more comfortable for us because our brains are wired this way to protect us from harm. If we assume the worst, then we’ll be ready when something wrong does happen. Although, we need to push ourselves to have a fresh perspective on things and consciously focus on the good. It may take some effort at first but eventually, your brain will get used to this method of thinking and will rewire itself. The people you surround yourself with make a big difference in the type of life you will have. Our social circles are critical to our happiness. A study that spanned over 75 years from Harvard said that “Those who kept warm relationships got to live longer and happier and the loners often died earlier.” So make sure if you’ve got good friends, to treat them well. If you just keep pushing towards your goal, one day you will achieve it. It doesn’t matter how long it takes or the obstacles you face, as long as you do not stop you will one day get to where you want to be in life. We all face hardships along the way. Nothing in this life comes easy, but that’s why we need to have the determination to keep moving forward. If you focus too much on the bad things that happened to you in the past, you will have trouble appreciating the present. We’ve all been wronged in one way or another and as horrible as those things might be, they are not who we are, they are just things that happened to us. Instead, try to have a positive outlook and focus on the things that will help you have a brighter future. Set a goal and figure out the steps you need to take to achieve it and stick to that plan. Whatever you choose to do should be done with the very best of your ability. This applies to every aspect of your life; your relationships, job, and hobbies are all important. Don’t halfway try and then give up because if you put the time and effort in you will achieve your goals no matter how distant they might seem at the beginning. Next time you’re angry about something, think of this quote. Many times people do or say things when they’re angry that only make the problem at hand worse. Nothing positive ever really comes out of anger. If you pause and think about the consequences of your actions, then you might find a better way of dealing with it. Now and then it’s wise to step back and take a good look at the big picture to make sure that you are still improving and are on your way to achieving your goal. If you aren’t doing the kind of progress that you hoped you would be at this point, then you should change your approach. Life experiences teach us valuable lessons and if we learn from the people around us then will be wiser and better equipped to deal with problems when they arise. Everyone you meet has something interesting they can teach you, and you’re also likely to make more friends when you’re interested in their experiences and the things they can show you. This works the other way around too; you never know when your skills could help another person.